The Quality of Life Issue provides guidance for physicians on choosing practices and communities. The Quality of Life Issue is designed to help physicians evaluate career opportunities in light of their family considerations and lifestyle preferences. Few professions require more rigorous education and training than the practice of medicine, but many physicians complete medical school and residency with little practical training for the life transitions and decisions that immediately await them. PracticeLink Magazine’s Annual Quality of Life Issue provides physicians in training and practice with the essential tips and valuable advice they need to evaluate job opportunities and communities in a way that will help them find the best fits from themselves and their families. In the cover story, “Forget the Joneses,” James Dahle, M.D., who blogs as the White Coat Investor, explores the idea that it’s not income that matters most when determining quality of life, but “out-go,” showing physicians how the spending habits they develop now will set the tone for their futures. Because where they spend their futures is another factor contributing to quality of life, the issue also provides a glimpse into the experiences of physicians living in different communities. Additionally, for physicians wondering how to put down roots while battling student loan debt, the Quality of Life Issue highlights how physicians have managed to buy homes, plan for retirement and tackle debt all at once. The Issue also takes a look at four family-friendly cities in which to live and practice and provides a snapshot of one family medicine physician’s job search. Company, specialty and employer indexes within the issue also help physicians find opportunities in their specialties and areas of interest. 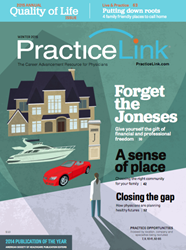 PracticeLink Magazine is a quarterly print and digital career advancement publication for physicians. Each themed issue provides relevant, compelling content on topics including contracts and compensation, quality of life, job searching and interviewing. The magazine was named 2014 ASPHE Publication of the Year and has won numerous awards for both content and design. PracticeLink is headquartered in Hinton, W.Va., and also maintains offices in St. Louis and Louisville, Ky.